Pathotype Tracker – Where is Ug99? Puccinia graminis Pers.:Pers. f. sp. tritici Eriks. E. Henn. Occurs worldwide wherever wheat is grown. It is most important where dews are frequent during and after heading and temperatures are warm, 18-30 C.
Losses are often severe (50 to 70%) over a large area and individual fields can be totally destroyed. Damage is greatest when the disease becomes severe before the grain is completely formed. In areas favorable for disease development, susceptible cultivars cannot be grown. Grain is shriveled due to the damage to the conducting tissue, resulting in less nutrient being transported to the grain. Severe disease can cause straw breakage, resulting in a loss of spikes with combine harvesting. Uredinia generally appear as oval lesions on leaf sheaths, true stem, and spike. Uredinia can appear on the leaves if other diseases have not killed them. Uredinia are brick red in color and can be seen to rupture the host epidermis, on the leaves uredinia generally penetrate to sporulate on both surfaces. Infected areas are rough to the touch. Stem rust is favored by hot days 25-30 C, mild nights 15-20 C with adequate moisture for night time dews. Wind can effectively disperse urediniospores over great distances. 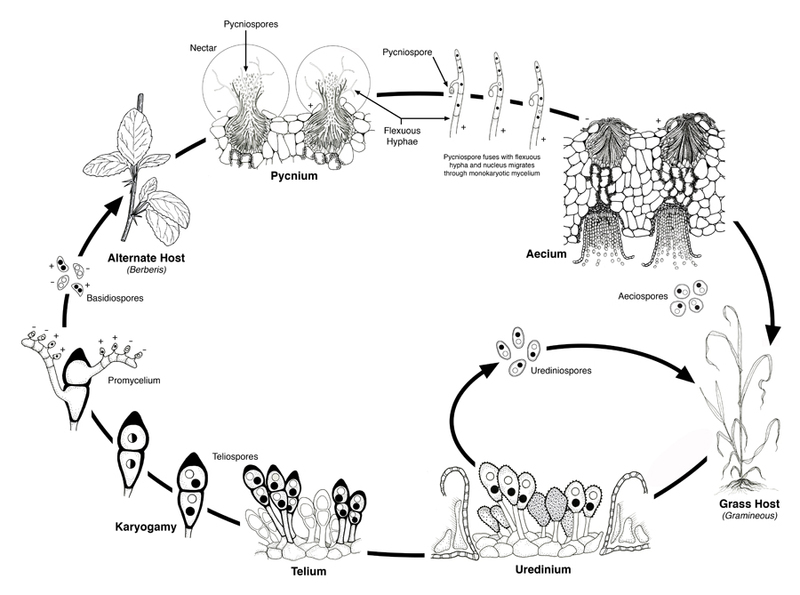 Rain is necessary for effective deposition of uredinospore involved in regional spore transport. Aeciospores from Berberis vulgaris are currently rare, but historically it was an important source of inoculum in northern North America and Europe. Mycelium or uredinia on volunteer wheat, are the most important source of inoculum in tropical and subtropical climates. Windblown urediniospores are usually from earlier maturing wheat from the south in the northern hemisphere, or from the north in the southern hemisphere. Urediniospores and aeciospore germinate when in contact with free water. Infection by penetration through the stoma. Penetration requires at least a low light intensity. Germination optimum is 18 C, latent period varies from 10 to 15 days in the field with temperatures of 15-30 C.
Stem rust can survive as teliospores during winter when aeciospores are a major source of inoculum. It generally survives as mycelium or uredinia on volunteer wheat during the non-wheat growing season. Uredinospore can be spread by wind into disease-free areas. Sporulating uredinia are active in tropical and some subtropical areas throughout the winter. Occasional dormant mycelium may survive beneath the snow pack in more northern temperate regions. Urediniospores and aeciospores are wind borne. Teliospores remain with the straw. 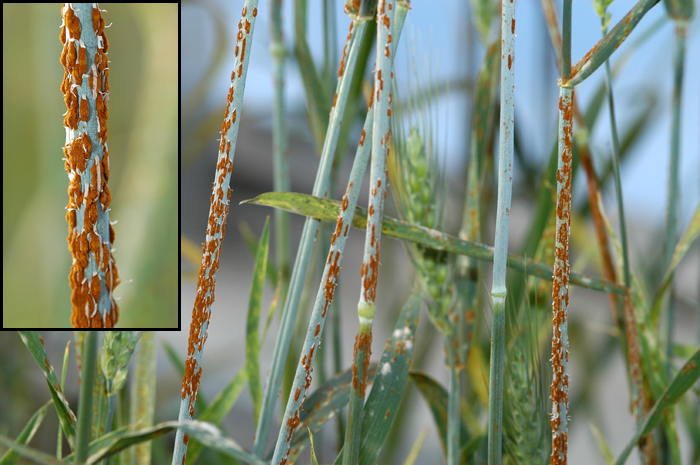 Stem rust is generally confined to Triticum species, although naturally infected plants of Secale cereale, Hordeum vulgaris, H. jubatum, H. pusillum, Elymus junceus occur. Many genera of the tribe Hordeae are infected when artificially inoculated. Other formae specialis of P. graminis attack many cereals and related grasses, and many species are susceptible to more than one formae specialis. Wanyera, R., Kinyua, M. G., Jin, Y. and Singh, R. P. 2006. The spread of stem rust caused by Puccinia graminis f. sp. tritici, with virulence on Sr31 in wheat in eastern Africa. Plant Disease 90:113. Jin, Y. and Singh, R. P. 2006. Resistance in U.S. wheat to recent eastern African isolates of Puccinia graminis f. sp. tritici with virulence to resistance gene Sr31. Plant Disease 90:476-480. Leonard, K. J. and Szabo, L. J. 2005. Stem rust of small grains and grasses caused by Puccinia graminis. Molecular Plant Pathology 6:99-111. Luig, N. H., 1985. Epidemiology in Australia and New Zealand. Pages 301-328 in: The Cereal Rusts Vol. II: Diseases, distribution, epidemiology and control. A. P. Roelfs and W. R. Bushnell eds., Academic Press, Orlando, Fl. Roelfs, A. P., 1985. Wheat and Rye stem rust. Pages 3-27 in: The Cereal Rusts Vol. II: Diseases, distribution, epidemiology and control. A. P. Roelfs and W. R. Bushnell eds., Academic Press, Orlando, Fl. Roelfs, A. P., 1985. Epidemiology in North America. Pages 403-434, in: The Cereal Rusts Vol. II: Diseases, distribution, epidemiology and control. A. P. Roelfs and W. R. Bushnell eds., Academic Press, Orlando, Fl. Saari, E. E. and Prescott, J. M., 1985. World distribution in relation to economic losses. Pages 259-298, in: The Cereal Rusts Vol. II: Diseases, distribution, epidemiology and control. A. P. Roelfs and W. R. Bushnell eds., Academic Press, Orlando, Fl.